This is a topic that as an instructor I get a variety of questions about. Everything from the mundane to quite serious safety concerns. For this blog, I will strive to address most of them. I think that the logical order to answering these questions would be starting with the most important safety concerns and then working down to the more trivial matters like equipment to bring and other general advice. Safety – Environmental. A pool is much different when compared to a water park which is much different when compared to a beach or ocean. Simple pools generally all have the same safety concerns. Children must be supervised by adults AT ALL TIMES, no exceptions. Follow all posted rules. No diving and no horseplay are common ones. Hot tubs and Spas are not meant for children. Finally, not a direct safety matter perhaps but just some advice, respect other guests in the pool or area. It makes for a much more enjoyable experience for everyone. Water parks or pools with water attractions (slides, etc.). Many slides or rides have a current at the end of them. Observe where the ride finishes and judge whether or not you or your family members will be comfortable in the conditions you observe. Also make sure you pay attention to any special rules any particular ride may have. For example, many rides have height or weight restrictions. Be sure to take these seriously, the park staff will. Too many times, I have seen a parent accompanying a disappointed child walking back through the wait line. They had either missed the sign with the height requirement or thought their child was “close enough” and were then turned away by the park lifeguard. Beach and ocean safety could take up an entire blog on its own but the short version boils down to two things. First, observe the conditions and use your own judgement based on what you see. Rough waves, high winds, obstacles, lifeguards and / or safety equipment on site, etc. Second, (you may be starting to see a theme here) follow all safety rules and regulations. Asking a lifeguard about any hazards that may be present at that site is a great way to evaluate the safety of that site. If in doubt, be much more cautious in open water than you would in a pool. A question I get on occasion is “how do I know if the water is ok?”. 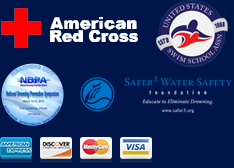 Water chemistry for pools in the USA is subject to fairly strict regulation. In NJ, the water is required to be tested every 2 hours. Also, a water sample from the pool is tested weekly by an independent laboratory for proper sanitizer levels and presence of bacteria. I have never, ever, had a problem with the chemistry of a pool in my travels. I advise using caution for hot tubs and spas. Due to their small volume and high temperature, the concentration of waste like sweat and sunscreen are much higher than in normal pools.